The ideal conclusion to 4th May (avoiding Star Wars jokes) would have been the Libdems taking control of Somerset County Council, winning all seats in Yeovil constituency etc. Obviously that didn’t happen, but the night, and the result wasn’t all doom and gloom. There were many positives to draw from the results. My main focus in the County elections was to ensure that Tony Lock was re-elected to represent Yeovil East, which he was with 49% of the vote. In Chard North, Libdem Amanda Broom also won the seat, from UKIP. 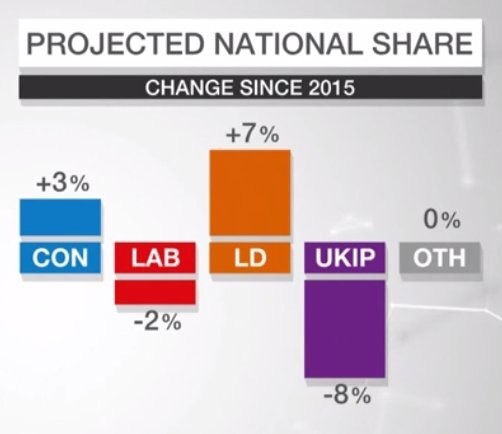 According to reports, apparently our vote share was 1% above the Conservatives. According to all national reporting the UKIP vote is going to the Torys, but the two results in Yeovil Constituency despute that, though I do own that Paddy’s BlueKip slogan is nationally probably correct. On a constituency level, based on vote share, we are well placed to regain the Parliamentary seat too. Nationally our vote share rose by 7%. Overall we won and lost with a net loss, but not as damning as some party’s experienced. I witnessed over the campaign a lot of hard work and commitment and do genuinely feel for those who didn’t get elected and know that many will fight again next time round with just as much vigour, hopefully gaining the right result. Locally, we keep hearing this statement, it seems to be a tag line at the end of posts potentially pointing a finger at Lib Dems. Funnily enough we haven’t seen that slogan today (In case you are reading this on ‘Dave’ LibDem’s have just won the Richmond Park by-election). The problem I have is that if this were aimed at the Liberal Democrat’s it would be wrong. We are still proud, still standing up for equality, fairness etc. and all those good things, still representing the 48% (probably more if you include those who have had a change of mind and those excluded from voting). So it can’t be us… So then who? Can it be an expression about the Conservative Party from one of their own? A Party that stood aside to give an independent candidate a better chance, but he still lost?A Party with an unelected Prime Minister? A Party where certain members promote UKIP to reign over Labour in the North as an attempted dig at Libdem’s? To be honest there isn’t enough page but I think you get the idea. If it is a self judgement, of the Tory’s, I guess it’s right, if not it’s wishful thinking. We may be taking small steps but Lib Dems are still here and STILL PROUD!! Yesterday I funded a SchoolBag, one of Yeovil Mayor’s chosen charities this year. Here is a little bit more about the charity and what they do. 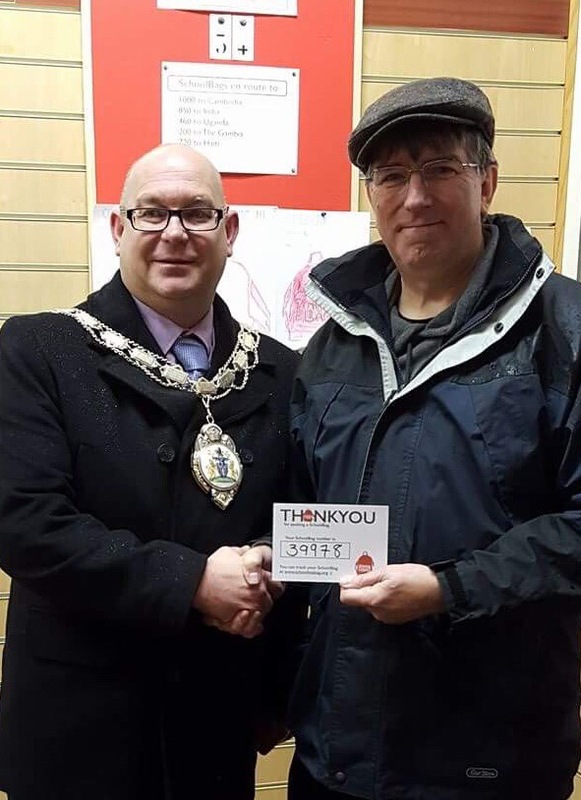 The Deputy Mayor, David Recardo has opted to fund a bag instead of sending Christmas cards this year. School in a Bag is run by the Piers Simon Appeal. The Piers Simon Appeal (PSA) was set up in memory of Piers aged 33 who died in the Indian Ocean Tsunami on the island of Koh Phi Phi in Thailand on December 26th 2004. 1. Orphan children were given ONE pencil a year by the Swaziland government. 2. Children received ONE meal a day at school (often their only meal each day) but without eating utensils they were unable to eat. The solution was to fill a rucksack with stationery and stainless steel eating utensils and in March 2009, the process of packing the 32,000 bags for children at 350 schools took place at the ShelterBox warehouse in Helston, Cornwall. The 5-day trip had a very strong impact emotionally on Henry, Celia and Luke. From the outset of forming the Piers Simon Appeal, helping children and enhancing education was always one of the charity objectives and these simple rucksacks filled with basic contents presented an opportunity to pursue the idea further. One week after their return, Luke packed away his garden design office, transformed it into the Piers Simon Appeal and coined the phrase ‘School in a Bag’. Through the fundraising of four local schools and PSA funds, the first 400 ‘SchoolBags’ were sent to two orphanages in Sierra Leone. Instead of being boxed up, these were sent as cargo in a minibus jointly funded by the PSA and Orphfund. In June 2009 Luke Simon and volunteer documentary photographer Jenny Hardy flew to Freetown to meet the van and distribute the SchoolBags. (LINK TO SIERRA LEONE PAGE IN MAP TAB). In January 2011 the board of the PSA unilaterally decided to make School in a Bag its own brand to give it its own identity and provide it with the capacity to grow beyond the catchment area of the PSA. At this time I also reflect on attending the remembrance parade at Old Steine in Brighton whilst growing up, carrying the flag on behalf of my Scout Troup. Looking back on what it meant to my dad, who served and was wounded in WW2. Remembering what it meant to him and his peers, thoughts of lost comrades that for some reason was never discussed, though we all knew the feelings were present. It is with regret that my dad passed away before I was elected to Council, though I know he would have been proud. No prouder than he would have been today to stand by my shoulder at the memorial remembering with me those that served for King/Queen and Country that we all should be free. Brexit means Brexit and Leave means Leave, but what DO they mean? So what does breakfast actually mean? If we are having breakfast it means that we have food of some sort, it doesn’t specify what sort of food, just that we will be eating. So that could be toast, grapefruit, English fry-up, continental etc etc. Taking this analogy back to Brexit, what it actually means is that we will leave the EU. We wont all like what is on the menu (as with breakfast) and some of us would rather remain in bed and pass on breakfast all together. The people of the UK voted for Brexit, they did not make their menu choices. At this time the ‘menu’ isn’t even written, though I doubt when it is, we wont fancy the fare on offer!! Unfortunately that behaviour transfers into adult life too, you know the sort, picking on minor failings, mimicking them and making them out to be bigger and more of an issue that they actually are. Not exclusively but it appears that some politician’s are no better than the classroom bully either, picking at others opinions without anything to offer of their own. Taking points in isolation rather than the wider points and then giving it the ‘look at me pose’ aren’t I great (or is that grate?). It would be wrong of me to single out anyone, or any incident but you know the type. Do or say anything if there is a chance they may be given some responsibility or prominence and then, rather than ending up like Churchill (Winston), they actually end up like Churchill (the nodding dog) serving no use but nodding at the right time. Forsaking others for personal gain too, I suspect. I have had my fill of playground bullies in the past, they used to worry me (and worse). Now they toughen my resolve, make me work harder and more determined fair play should win the day. In the Libdem’s I can identify with the drive for equality, opportunity for all etc. quite the opposite to the bullies.